Koal Cave is a grotto just outside of Gnisis. 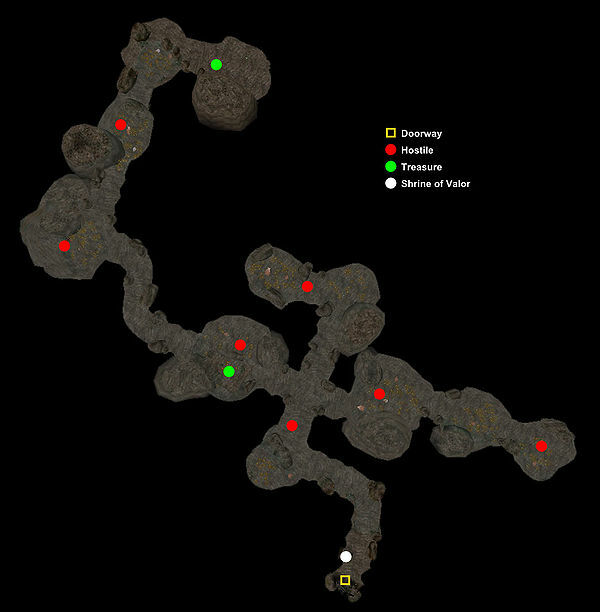 Sacred to the Temple, Koal Cave is the site of Vivec's battle with Ruddy Man, and one of the stations on the Pilgrimages of the Seven Graces. The quickest way to get there is to head south from Gnisis across the Samsi, about where Hentus can be found bathing, and look for a south-facing cave entrance directly underneath a natural arch. 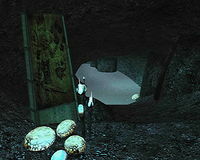 The shrine is immediately inside the entrance, you will need some dreugh wax which you can buy in the Temple in Gnisis, or just find and kill a dreugh inside the cave. Activate the shrine to receive the blessing of Fortify Unarmored, Light Armor, Medium Armor, Heavy Armor 10 pts for 48 min. Depending on your level and desire, one can "re-create" that battle, since the place is littered with leveled water creatures. If you kill the dreugh warlord in the cave, you'll also receive an enchanted dreugh cuirass for each dreugh wax you donate. There are a number of kollops for pearl divers, and a dead adventurer in the reeds near the entrance. It is illegal to sleep in Koal Cave. This page was last modified on 8 September 2018, at 03:56.